Kodabar DayZ blog: Kimi Raikkonen is back in F1. Does he care? 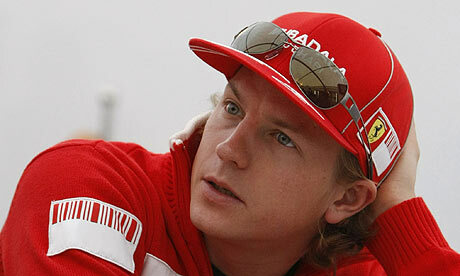 When I was jabbering on about Formula 1 the other day, there was one driver that I didn't mention: Kimi Räikkönen. After retiring from F1 a couple of years ago, Kimi's back for the 2012 season and I'm quite excited about this, mostly because Kimi isn't. To be fair, Kimi doesn't seem to be excited about anything ever. For many drivers, the effort, expense and difficulty of getting to F1 often means that it becomes all they can think about. When Michael Schumacher 'retired', he was a pathetic sight hanging around the Ferrari pit lane. Clearly, he had nothing else in his life; nothing to do at all. So it's unusual for a driver to have other interests and with Kimi, you rather get the feeling that Formula 1 isn't even his favourite sport. In the clip above, Kimi has just won his first Formula 1 race - the 2003 Malaysian Grand Prix. You'd expect most people to be a little excited, especially when starting seventh and passing both the Ferraris and the Renaults, but for Kimi "the race was quite good." Indeed, Kimi's often so excited before a race that he regularly falls asleep; on his F1 debut, he managed to doze off just twenty minutes before the start. Lest Kimi be seen as a dour, humourless robot, when he's not racing F1 cars he's jumping on stage at lap dancing clubs and stripping off himself, sneaking off to compete in dangerous sports that his F1 contract forbids (he signs himself as James Hunt when doing so), going out drinking heavily with his friends or setting fire to stuff and getting arrested for breaking things (don't ask). Sadly, Kimi's personal website is currently down for editing as I'd love to have seen what it says at the moment. During his previous stint in F1 his site barely mentioned the sport. It was full of stuff about Kimi racing snowmobiles, going snowboarding, his motocross team and a dozen other things before it mentioned Formula 1... which was, like, y'know his frigging job at the time. This is why I love Kimi so much: on any given day he's got five things to do that matter more to him than driving an F1 car. Thanks to the money and the TV interest, Formula 1 interviews are normally extremely dull - drivers just say what they're told to say and most of them parrot the same lines endlessly. Blah, blah, blah, try our best, blah, blah, whole team has worked so hard, blah, blah, passion for the sport, blah, blah, dedication, blah, blah, blah. So I find it very refreshing for there to be a driver who doesn't stick to the 'party line' and just says what he likes, no matter how difficult that makes life for interviewers. So Kimi's back in F1 after two years away. Is he still any good or is he going to go down the Schumacher road of mediocrity? Nah, Kimi will be fine. In the test session at Jerez yesterday Raikonnen was faster than everyone else. In a test session, the teams are usually trying different parts, collecting data, etc, so just because he was fastest doesn't mean his car's at the top of the field, but it certainly means it's not going to be at the back. 2012 looks to be quite interesting in Formula 1. There are six world champions on the grid so the racing is likely to be close if Vettel doesn't just drive off up the road. Kimi will be driving the confusingly-named Lotus (there was a Lotus Racing team in F1 last year, but they've changed their name to Caterham whilst the former Renault team is now Lotus). They didn't have the fastest car last year and they haven't gone for a radically different car this year, so will it be fast enough to challenge for race wins? And will Kimi care either way? Dunno, but I'll be watching. It such a best information for the F1. Thanks to share interesting and informative information.